Arrange 4 quarters of sandwich bread in each ramekin. Sprinkle soaked raisins then drizzle butter over. Heat cream and milk a pot until hot. Mix egg and sugar in a mixing bowl. Stir hot cream mixture into bowl until well combined. Strain and pour onto sandwich bread. Set aside for 30 minutes for bread to soak up mixture. Bake for 30 minutes, until the top of the pudding is slightly brown. 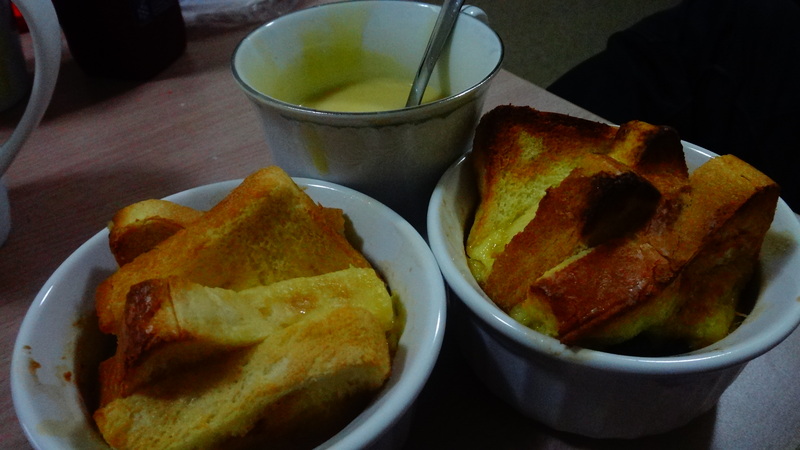 Serve warm with custard sauce. Mix all the ingredients together in a pot and cook, stirring over medium heat until custard coats the back of a spoon. Add in the rum left from soaking the raisins. YES. this version is much better than the previous one!